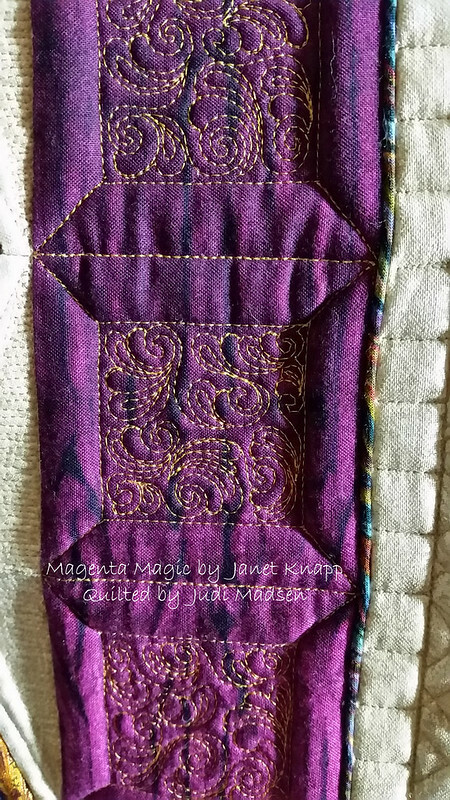 Magenta Magic by Janet Knapp finished. 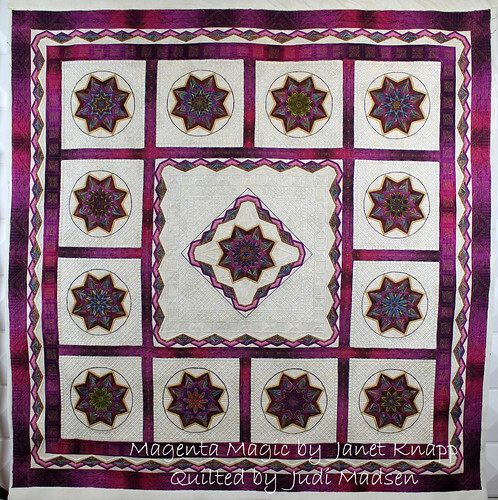 This quilt is called Magenta Magic by Janet Knapp. This is an original design and is beautiful to say the least. The pattern is not available, so please don't ask for it. 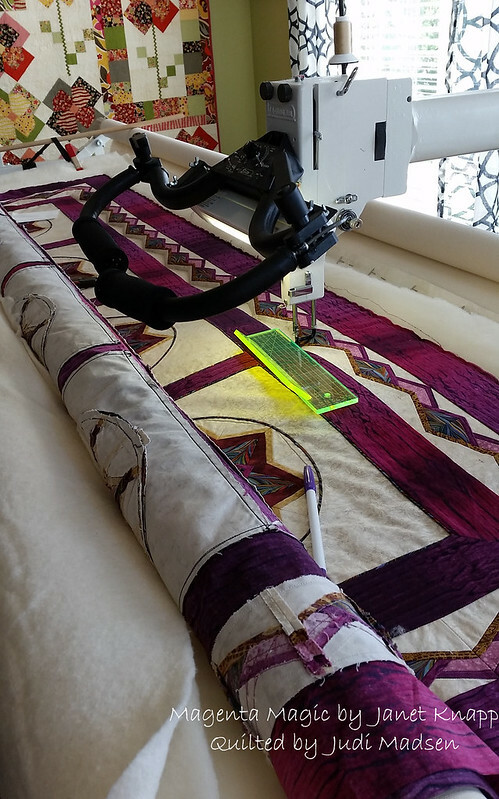 ;-) You will be able to see the quilt in quilt shows starting next year. Yay! 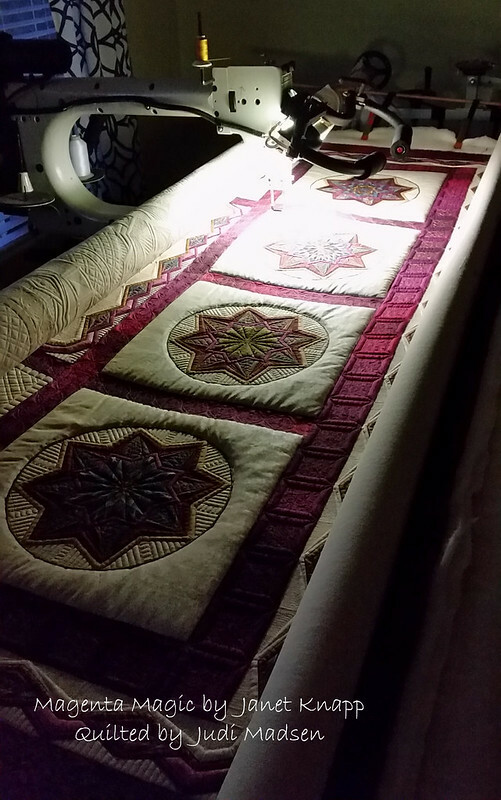 "Being encouraged for many years by my husband to design my very own quilt I finally began my process. Starting with a very large sheet of graph paper, a draftsman's ruler, a #2 Futura drawing pencil and Pink Pearl eraser, I began my adventure. 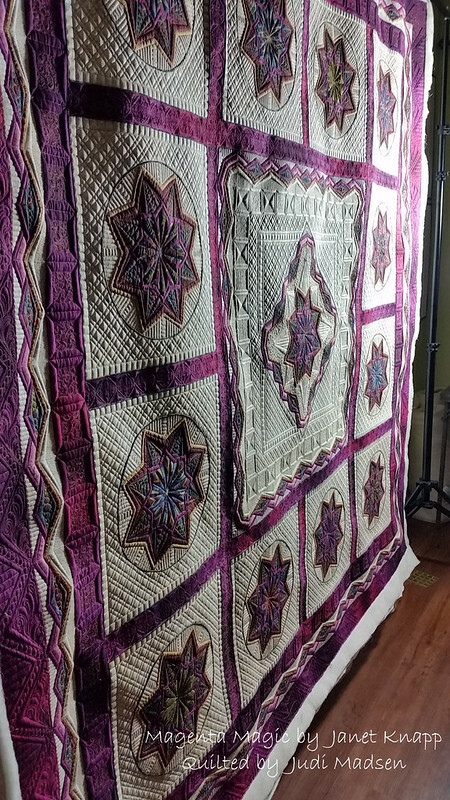 I have always liked stars, lots of angles, drawing lines, fussy cutting, reading Jinny Beyer's books, the opportunity to take her class on color - I was truly motivated to design this quilt. 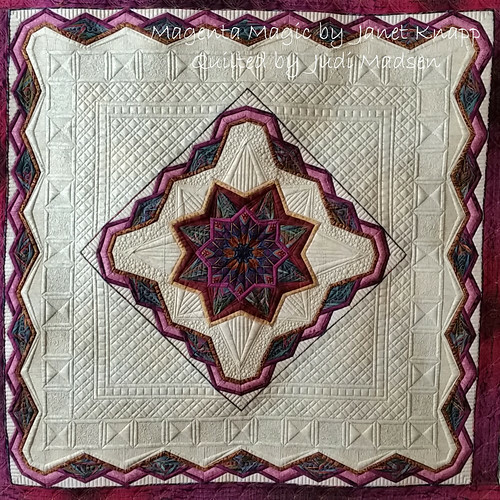 As I designed the center block, I envisioned an entirely different quilt. Possibly spikes going out in all directions ...certainly not 1 block and 12 circles (each made up of 92 pieces of fabric), foundation piecing the entire quilt and adding endless yards of piping. Unfinished, I set my design aside and set out searching for fabrics. Once I found Paula Nadelstern's great line of Luminosity fabric I purchased yardage of each color choice, after trial and error decided on the magenta/gold shades and then filled in with others. 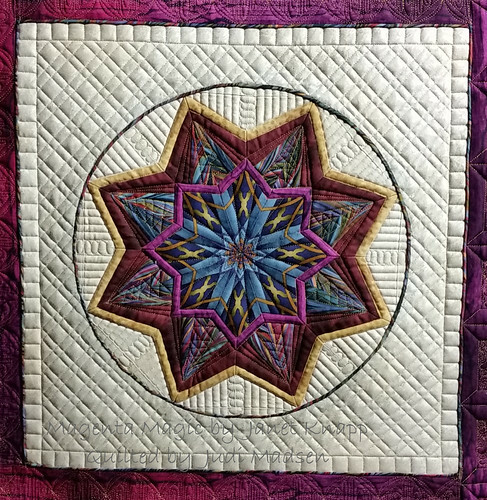 The border design was great fun to do - however I had only intended to do a pieced border around the center block. One rainy day at our cabin I found myself doing endless border pieces and thus...more borders. This has been a 10 year adventure. 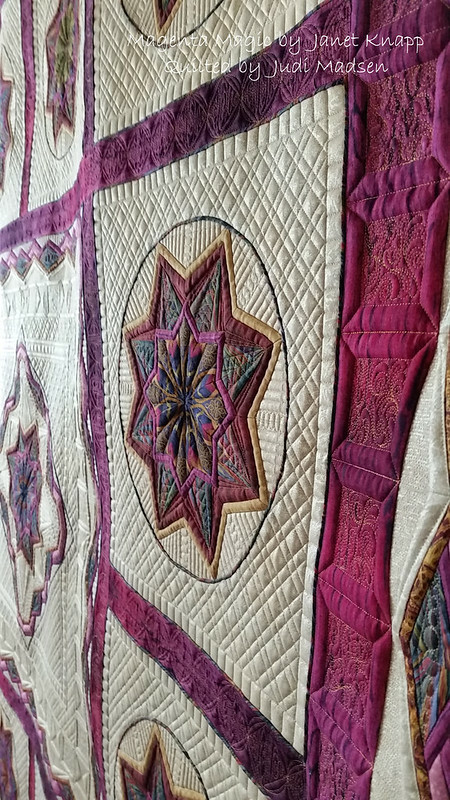 However, throughout the 10 years I have completed several other large quilts and always going back to my designed quilt to finish yet another circle or another border piece. 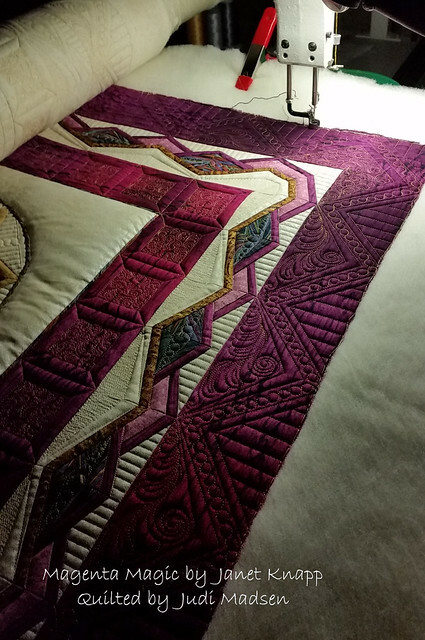 This entire quilt has never been far away in my sewing room." Me again, isn't that amazing? 10 years in the making. My 10 weeks doesn't sound so crazy now. 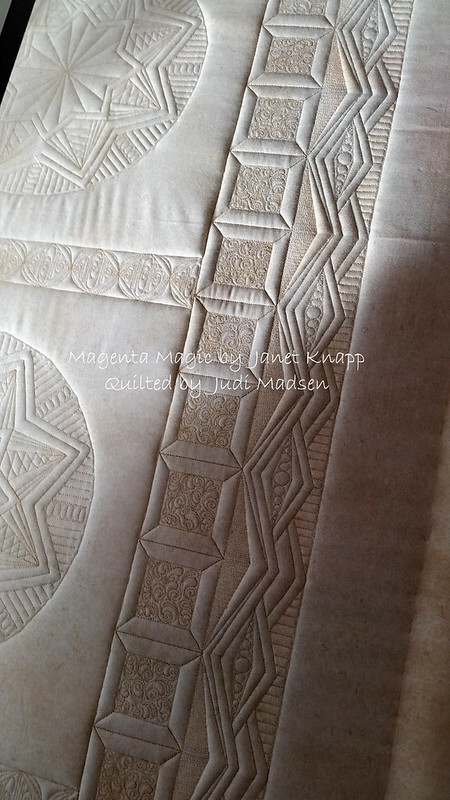 This quilt top was one that I wasn't totally sure what design I was going to quilt before I put it on the frames. So, I just went for it. 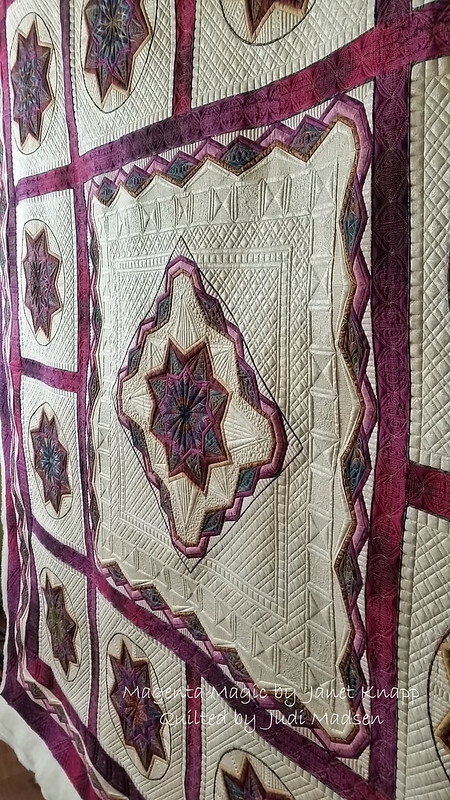 I used 2 layers of batting for this quilt. One layer was Hobbs cotton/wool blend and the other was 80/20 cotton/poly blend. I love the combo of those two batts. I used Kimono Silk thread, colors 365 and 304. 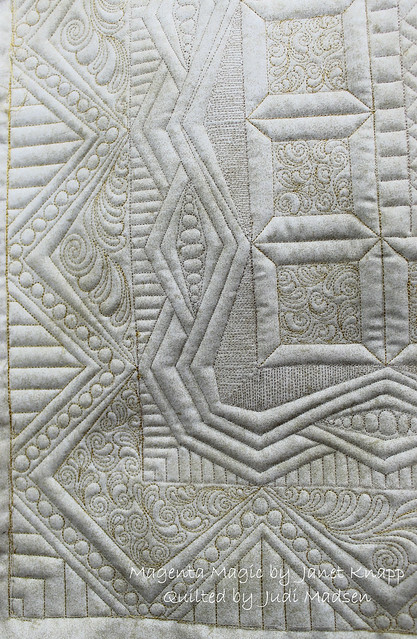 You can see how the batting really makes the detail in the quilting pop. 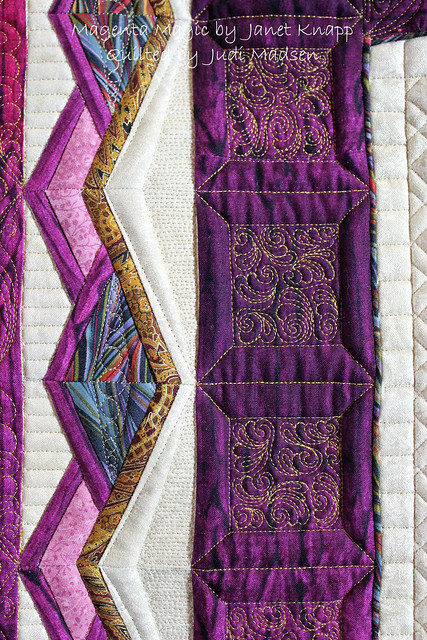 I had a great time quilting these small piecing areas. The goal was to enhance the piecing without taking away from it and I think I accomplished that. You can see the fullness in the batting in this picture. The last row is the only row that I went ahead and saved the lighter thread for the end. Throughout the top 3/4ths of the quilt I switch thread to finish the row before I advanced the quilt. The center of the quilt was very fun to quilt up. The design came together so nicely. I wanted the center star to be enhanced with more points. The square border is mimicking the outside border squares. I try to pull designs in from different parts of the quilt to make them all work together. 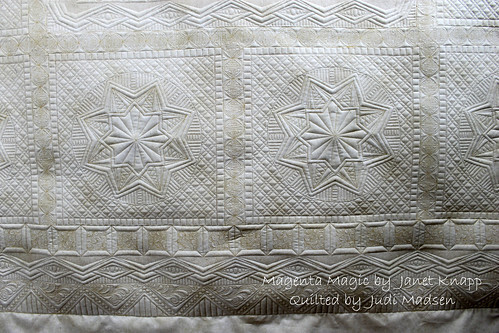 The center cross-hatching is perfect with the half inch squares, which can also be seen in the star blocks as a border. Fabulous. 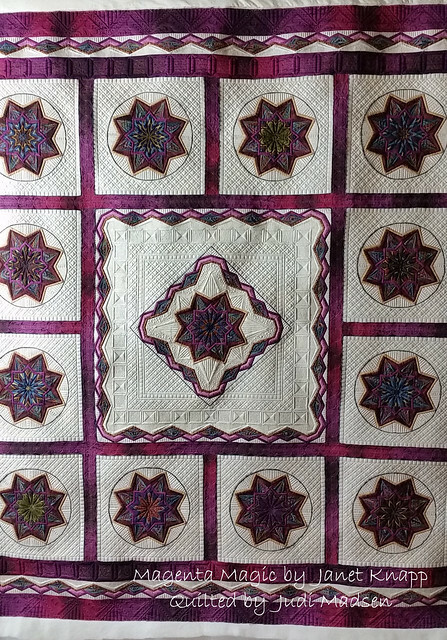 I love how each of Janet's star blocks are different because of how she used the fabric. Amazing talent and patience. Isn't that texture just amazing? I really enjoyed these borders. 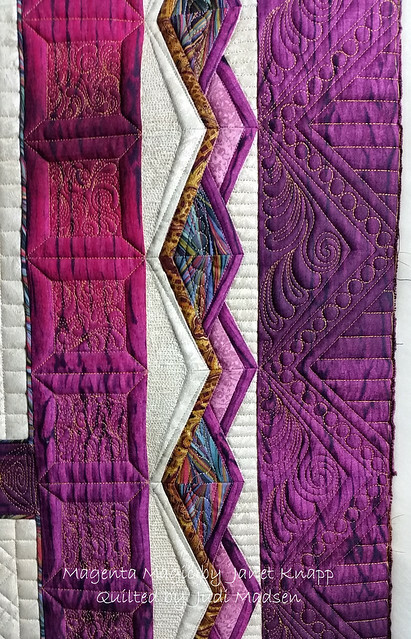 I used my purple disappearing marker for the marking in this quilt. I did go through about 4 markers though because of the dark fabric - it works pretty well at the beginning of the makers life, but will get lighter as you use it. Soft feathers with straight lines. Love it. I look at this and just love it! I also love that I am finished. hehe! I can't get enough of this texture. 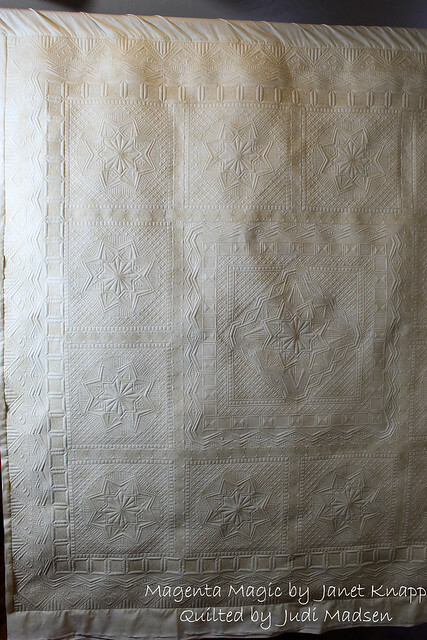 The back is awesome enough for a whole cloth quilt. It turned out fabulous. Almost as good as the front. 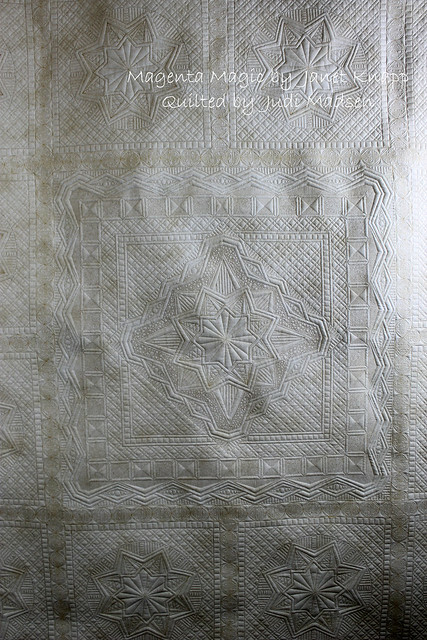 One more showing the amazing texture on this quilt. It is so beautiful. I love it and can't thank Janet enough for letting me work my magic on her "Magenta Magic." 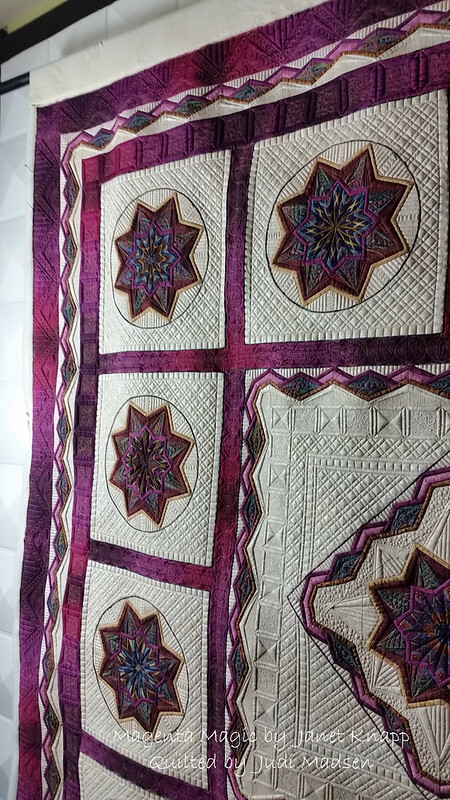 I hope you enjoy this quilt as much as I do. In the meantime, it's December! What the? Where did the time go? Christmas is just around the corner - hopefully I will be back on this blog before then to wish you a Merry Christmas! In the meantime, you can find me on Instagram and Facebook.